Congratulations to the teams from Southern Illinois University Edwardsville (1st place) and Missouri Science & Technology (2nd place) for thier strong placement in the Cost Category in the Mortar Workability Competition at the 2019 ACI Concrete Convention and Exposition in Quebec, Canada! The Missouri Chapter of the American Concrete Institute is proud of how you have represented us well! More details about the student competition can be read here on the ACI Website. 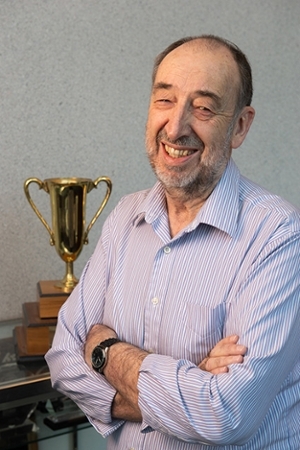 Snell has a storied history with the SOE as a scholar and educator. He retired as professor emeritus in 2002. But, the Edwardsville resident’s passion for concrete and SIUE’s growing program has held strong. His recent contribution of $15,000 will support the SIUE student chapter of the American Concrete Institute (ACI). While his concrete expertise led him to successful work in industry and consulting, he decided it was future industry leaders he could benefit most. Instead of troubleshooting problems, he wanted to prevent them by educating future leaders. Based on his own successful experiences in student competition, Snell made it a priority to get SIUE students involved in the American Concrete Institute and expose them to experiential learning opportunities. Since SIUE brought home that first trophy, its display case has filled with awards and accolades from student competitions. To Snell, the most meaningful show of success with which the students leave their activities are job connections, national exposure and travel opportunities. That’s why his support for such student involvement has never wavered. The ACI student competitions have grown dramatically since their inception, presenting ample opportunity as well as higher costs and stiffer competition for participating SIUE students. Snell’s generous contribution to the ACI student chapter, and the corresponding development fund that’s been established, will help students continue their involvement by assisting with registration fees, materials and travel costs. “Student involvement is hugely important,” Snell said. “In fact, it was winning a student competition that led me to believe ‘wow, I’m on the right path.’ These competitions have become internationally attended, competitive processes. I want our students to continue to compete at a high level, and participate in these impactful opportunities that bring recognition to the quality of our students and SIUE." Since his retirement, Snell and his wife Billie, an SIUE alumna, have traveled extensively around the globe, especially to developing countries, to educate others on the value of concrete, its uses, the importance of training and safety. The concrete consultant has visited such countries as Mongolia, Ethiopia, Ghana, Saudi Arabia and Singapore. He remains active in the Missouri ACI Chapter, which includes Illinois’ Madison and St. Clair Counties. Snell weaves concrete into all he does, leading workshops and hosting public presentations. The biggest clarification he makes to those less familiar with concrete? Cement and concrete are not one in the same. Rather, cement is the powder that binds the rock, sand and water that comprise concrete. ACI conventions are held twice annually. The 2019 student competitions will be held in March in Quebec City, Canada and in October in Cincinnati, Ohio. For more information on contributing to the Luke Snell Chapter of the American Concrete Institute at SIUE Development, visit siue.edu/give/ACI. Photos: SIUE professor emeritus Luke Snell, PE, stands by the trophy SIUE ACI Student Chapter members won at the first ACI concrete cube competition in 1980. 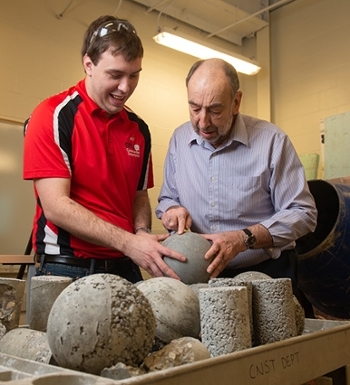 SIUE professor emeritus Luke Snell, PE, offers his concrete expertise to senior construction management major and SIUE ACI Student Chapter vice president David Rall. The American Concrete Institute has named Missouri University of Science & Technology and Southern Illinois University at Edwardsville with the ACI Award for University Student Activities. The award uses a points system based on participation in concrete related activities and programs to reward academic institutions. Universities that have earned 12 or more points are recognized as Excellent and those with six to eleven points achieve Outstanding status. Points can be earned for the number of students with ACI membership, participation in regional and national concrete competitions, ACI Convention and Committee attendance, community service, student chapter activities, and hosting campus meetings and events. Submissions for this year’s award program increased by 70% from 2017. Thirty-five universities were designated as Excellent and eighty as Outstanding for the year 2018. Awardees will receive an electronic banner to display on social media and a physical banner to display on campus. Applications for the 2019 program will be due January 31, 2020. The complete list of the 2018 ACI Award University Winners are available online under the 2018 Past Winners section at www.concrete.org/students/universityaward. The Missouri Chapter ACI had 3 teams entering the student competition at Las Vegas in October, 2018. This year's competition was to make a 4 X 8 inch cylinder of pervious concrete. The cylinder was judged on how fast water would pass thorough the concrete, tensile strength as determined by the splitting cylinder test, the cement efficiency of the mixture design and a written report. Southern Illinois University Edwardsville – 45th overall, best result 24th in tensile strength. Fantstic job representing the Missouri Chapter ACI!